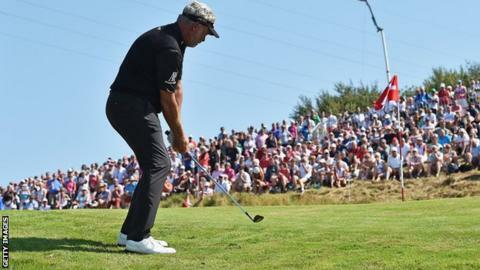 Darren Clarke's hopes of mounting a challenge at the Made in Denmark event were hit by a poor finish to his second round in Farso. 2011 Open champion Clarke moved into the top 10 on six under par after 16 holes before closing his round with a bogey and a double bogey. That meant a one-under 70 which left him sharing 26th, nine behind leader David Horsey, who leads on 12 under. Michael Hoey shot a second 71 and survived into the weekend on level par. Hoey, who fired four birdies and four bogeys, finished on the cut mark of level par. Five-times European Tour winner Hoey was involved in something of a saga at last year's event when he flew to Amsterdam after thinking that he had missed the cut only to find out that he had squeezed into the weekend action. Hoey then tried to book a return flight to Denmark but was told the airline lost his clubs. In the time spent trying to locate them, Hoey missed the one flight that would have got him back in time to tee off at 07:40 BST on the Saturday so he was then forced to withdraw. Hoey is currently 80th in the Race to Dubai standings but has produced better form in recent events having reaching the quarter-finals at the Paul Lawrie Match Play and also shared seventh at the BMW International Open in Germany. After starting at the 10th, Clarke went out in two-over-par 37 but four birdies and an eagle over the opening seven holes of the back nine moved him into a challenging position. However, the European Ryder Cup captain's good work was undone by his poor finish. Clarke has only managed two top-20 finishes this season and is currently 130th in the order of merit standings. Peter Lawrie boosted his chances of regaining his European Tour card after a 69 left him sharing sixth spot on seven under. Lawrie does not have a full tour card this year but the former Spanish Open champion has played in a number of events and is currently 125th in the Race to Dubai, with the top 110 set to retain cards for next season. County Down-based Simon Thornton is in the group including Clarke on three under after a 70 while Kevin Phelan is also guaranteed weekend action after a 69 left him on two under. However, Damien McGrane's struggles continued as he missed the cut on three over after a 73. McGrane has held a full European Tour card since 2003 but the 2008 China Open champion is currently a lowly 179th in the Race to Dubai standings and is facing an unwanted visit to the tour school. Overnight leader Horsey added a 67 to his opening 63 which left him three ahead of John Parry and Richard Green.